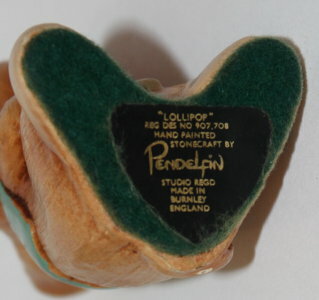 PenDelfin Lollipop mouse designed by Jean Walmsley Heap. The PenDelfin Studios produced a family of three mice comprising of the PenDelfin Mother Mouse, PenDelfin Father Mouse and PenDelfin Lollipop Mouse. They were made in brown and grey. 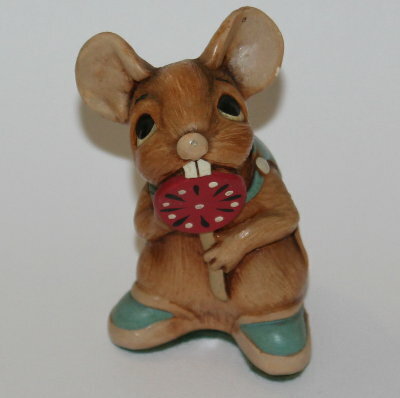 This is a brown PenDelfin Lollipop mouse, and is an early piece of PenDelfin, only produced by the PenDelfin Studios from c1961 until 1966. 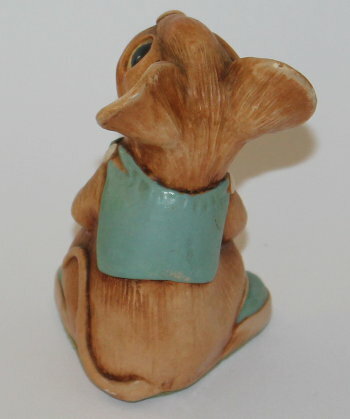 This PenDelfin mouse is wearing a blue coat and shoes holding a brightly coloured red lollipop. On his base he has his original green felt and old PenDelfin black triangular Lollipop PenDelfin Studios label. Condition: Very good overall condition with just some paint flakes. A really lovely example with a brightly coloured lollipop!